Rolfing® is a specialized type of physical rehabilitation that works with ligaments, tendons, and a sheet of connective tissue that covers all joints, organs, and muscles. Once these tissues are in the right position and functioning correctly, the body can move freely without pain. Many times pain or restricted movement is only a symptom of a problem somewhere else in the body. When part of the body is injured, misaligned, or cannot move freely, the rest of the body has to compensate. Muscles may have to work harder. There may be strain on joints, ligaments or tendons. The key to returning the body to better function is resolving not just the problem, but the compensations too. Rolfing can resolve the cause of pain and movement restrictions by restoring function and balance to the entire system. As a Certified Rolfer™, I treat not just the symptom, but the source of pain, restricted movement, misalignment and poor posture. Your bones, joints, and muscles can then do their job without stress or pain. Unlike massage, Chiropractic, or pain medications, the results from Rolfing are long-lasting, many times permanent. For this reason, Rolfing is done in a limited number of sessions. Most people find their problem is resolved very early, yet they complete all the Rolfing sessions to ensure their body functions at its highest and best potential for years to come. If all sessions are not completed, there can still be very good results. Because results last, a session is never repeated. Each Rolfing session creates a foundation on which to build your body’s healthy function and alignment. Building on these results, a short series of ten sessions transforms your body to a high level of pain free movement, coordination, and balance. Rolfers don’t massages muscles, align bones, give you exercises, use machines, or do energy work. Rolfing is hands-on work that is very different from other treatments. It transforms how your body functions. Separate body parts begin to work together as one, with ease and strength, in a more coordinated and balanced way. Alignment and posture improve, and many people feel lighter and have more energy. Problems usually get resolved once and for all. Rolfing restores support, proper alignment, and freedom of movement to the entire structure so the whole system can function as it once did. We don’t hang off our skeletons. All of our separate bones, muscles, and organs are supported and held in the right place by ligaments, tendons, and the connective tissue that wraps joints, organs and muscles. If any area of this web-like system is injured, restricted, or positioned incorrectly, it affects the entire system. Rolfing restores order to this system by easing restrictions in this supportive tissue, and getting it in the right position. For instance, rather than working on single areas or indvidual tissues, the Rolfer might work with the line of support that begins at your knees, crosses over the front of the pelvis, then goes down into your lower back and up into your shoulder blades. When the entire body's system is aligned and functioning correctly, force is transmitted across joints and distributed evenly throughout your muscles and bones. Injuries, fatigue, tight muscles, soreness, and pain are less likely to occur. Your entire body can function with greater ease and less effort - moving freely, without pain! Your optimum comfort is my priority. If Rolfing hurts, it usually doesn’t work as well. I use a slow, gentle approach to allow your body to change at its own pace. Rather than being forced, you will experience a gentle, slow touch that works with your body’s needs. having their problem resolved once and for all! Who Is Qualified To Do Rolfing™? Rolfing® is not deep tissue massage or myofascial release. Trust only a Certified Rolfer™ trained at The Rolf Institute®, the only school to provide the education and skills necessary to become a Certified Rolfer™. Rolfing is powerful and complex. It is not taught in Pensacola or other locations outside of The Rolf Institute in Boulder, Colorado (or one of its five international locations). This extensive, in-depth program ensures graduates are qualified to offer this work safely and effectively. Be sure you are in safe hands with an actual Certified Rolfer™. Restore your body’s youthful suppleness and elasticity! There is a good possibility for big improvement even if you have injuries or problems from decades ago. In fact, Rolfing really shines when it comes to very old injuries, accidents or surgeries. The cause of pain and movement restrictions can be resolved as Rolfing restores function and balance to your entire system. Rolfing can rejuvenate your body! Reclaim Your Quality Of Life With Rolfing! Join the many people who benefited from Rolfing. You can read below, in their own words, their deep gratitude for how their lives have improved. Start living pain-free now! Book your session today. I think Rolfing may have saved my life. For 30 years I had suffered with fibromyalgia, chronic fatigue syndrome, tremendous pain from severe accidents including a broken neck, cracked sacrum and herniated disks. I also had post traumatic stress disorder. Some days it was all I could do to get from the bed to the chair. Less than a year after starting Rolfing treatment I am running a horse farm, riding horses, lifting hay bales and 50 pound feed bags. I am pain free and have an amazingly successful and happy life. If Rolfing didn’t save me, it at least gave me my life back. Rolfing made a huge difference in the way I feel. After 2 major back surgeries I thought I was destined to live a life of stiffness and pain. After completing the sessions I am more flexible, walk more upright, and with a spring in my step. I also believe my pain has been all but eliminated. Thank you, Sharalee. About 50 years ago I had a heart condition which required 2 years of bed rest sitting with a pillow behind me. It corrected the heart problem but left me with poor posture. Several years ago I heard about Structural Integration and took 10 sessions with someone who was not Rolf trained and certified. It did not provide any meaningful help. However, doing 10 Rolfing sessions with Sharalee made a remarkable improvement in my posture to the point that I am now proud rather than embarrassed. I tried both Rolfing and myofascial release. The myofascial release was very painful. 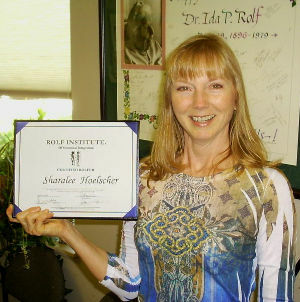 Rolfing with Sharalee Hoelscher did not hurt at all, and helped me so much. I tried Rolfing with Sharalee Hoelscher because after knee surgery I suffered from tightness and pain in my leg for which nothing had helped. After the first session there was a noticeable change and after three sessions the pain was almost completely gone. I’m a believer! You’ll feel better like when you get a massage ... The difference is it lasts and lasts. Prior to Rolfing my left lung and left diaphragm had been only 20% functional for many years. Doctors assumed I injured it playing football in college. After Rolfing my doctor took chest x-rays to check for infection in my lungs. He said there had been a significant change in the results. My left diaphragm was level with the right side. For the first time in many, many years I am now better able to expel that lung of congestion. Wintertime has always been tough on my lungs, but this winter I have not had pneumonia. I am certain this improvement is due to Rolfing and am grateful for Sharalee’s expertise. I had been limping chronically with unknown pain in my foot. After Rolfing I’m no longer limping and am able to walk comfortably without pain. My orthopedic doctor said I am greatly improved. Also, I was diagnosed with deQuervain’s Tenosynovitis in my wrist due to improper crutch walking. Rolfing greatly reduced the pain, tenderness, and increased my range of motion in my wrist and hand. Thank you, Sharalee Hoelscher. Your professionalism is superb. Amazing! With Rolfing I actually feel better than before the injury! I am now forever aware of my body, how it moves, it‘s ease, improved balance and center. Also, learning how to sit correctly at my computer means no more pain! Just a quick note to let you know how N___ (the trainer who referred me) and I did at the Big Sur Marathon in Monterey, CA, and to express my gratitude for the work you’ve done as my Rolfer. We both had a great run of 18 miles with numerous hills, sun, fog, and headwinds. It’s been a long time since I was able to run that distance so comfortably. I never had an issue with the low back, hamstring tendonitis, or plantar fascitis in either foot. I had no issues with muscle soreness. Having entered this marathon greatly under-trained due to the foot issues, I credit the Rolfing you’ve done as being principally the reason I felt and continue to feel so much better. With two thumbs up at the finish line, N___ and I agreed that Rolfing played a significant part in our successful marathon experience.